What's the Difference from One Product to Another? Assuming they all work as designed, why choose one over another? The answer comes down to flow. The bigger the regulator, the more water it will pass. Our models are all lead-free as they come from Watts or Fairview. Always choose a regulator with a flow rating that is as much as you can use. The most an RV can use is 3-3.5 gpm. The 263A-LF has been our most popular for many years. If you are going outside with your regulator in the weather, the s/s exterior parts kit and s/s oil-filled gauge will hold up to prevent rust the best. The standard model is fine for use in compartments or service bays, or if covered from moisture. The picture above shows numerous models we have carried over many years. Some have finally been discontinued, but the 263A has been the best seller and we keep all parts for the unit, if ever needed. We sell a complete line of regulators, all ready to install it in your system. Just take it out of the box and hook it up! 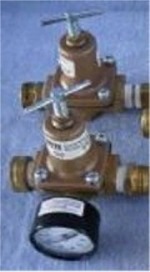 The lowest rung on the regulator ladder is occupied by small, in-line regulators. 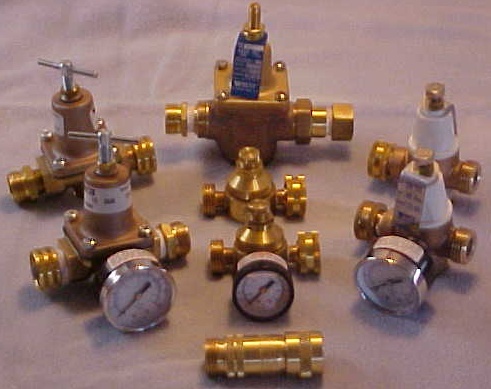 The brass unit is one typically included with your RV and sold in many RV supply houses. It has tiny orifices that the water must pass through and seriously restricts the overall water flow to your coach. This unit comes with a preset maximum pressure of 45, even occasionally 55 psi that cannot be changed. Only the new Fairview has a truly unrestricted flow. An industrial regulator with larger orifices for better flow is the Watts Model 263A. 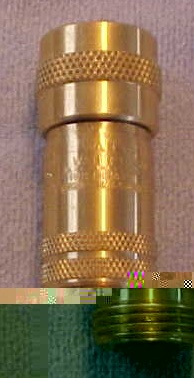 This brass unit is an RV adjustable water pressure regulator with a gauge, though it is also offered without a pressure gauge. Because of its size and lighter weight, it is our most popular model and it produced a flow of 4 to 4.5 gpm in our test. All Watts regulators can be disassembled for cleaning and rebuild kits are available to keep them operating for many years.